In Hong Kong yesterday a Cantonese speaking construction engineer visited me to schedule work. He spoke as much English and Mandarin as I spoke Cantonese, so it was a conversation laced with body language. He said they’d come back “luk sei” (六四, six four, meaning June 4th), the anniversary of the Tiananmen Square crackdown. He said it again, “luk sei,” and laughed awkwardly. He asked if I knew the significance of the day. I nodded. He pretended to spray bullets from an imaginary machine gun to be sure I got the point. Tonight in Hong Kong, as every year since 1989, there will be a candlelight vigil to remember the events of June 4th 1989. A record number of 180,000 are expected. In mainland China five years ago I asked my Mandarin tutor if she knew about 1989’s famous “Tank Man.” I had heard that many in China were not aware of the image of the man with the bags blocking an advancing line of tanks. She told me that she did know about this photograph. She told me that it illustrated the great restraint the People’s Liberation Army displayed when dealing with the Tiananmen protestors. She said, the PLA could have simply ran over him or shot him, but they didn’t, they carefully tried to maneuver around him. Today in mainland China there will be no official commemoration. Students across the border from Hong Kong in Shenzhen have been warned not to wear “mourning clothes” and that any on or off campus demonstrations will be clamped down. Last night I finished reading Ma Jian’s “Beijing Coma,” which tells the story of the build up to June 4th from the eyes of a fictitious Beijing University student. He remembers the 1989 protests as he lingers in the comatose condition. A condition he fell into after being struck in the head with a bullet in the early morning hours of the hardliner’s June 4th crackdown against the student protestors. In his retelling of the protest, he lingers for pages over the inner workings, camaraderie and turf wars of the student movement. Knowing the outcome, working through the long read to the ultimate bloody end is as harrowing as it is gripping. While remembering the past he also hears snippets of the changes sweeping through China throughout the 1990s. He hears about the deaths/imprisonments/lives abroad/money-making of his Tiananmen Square student compatriots. He learns of the crackdown on Falun Gong, the arrival of pagers and computers, the return of Hong Kong and then Macau to mainland China, and the demolitions transforming Beijing in advance of the Olympics. It is a long, but worth-while read. Please also see this riveting series of photographs posted by The Atlantic on last year’s anniversary: Tiananmen Square, Then and Now. Sounds like a very interesting read. I’ve a Caucasian high school friend who was living in Beijing (teaching violin) during the Tianmen uprising. She remembers being smuggled out of the city to the airport riding in the back of a car underneath some blankets. The whole city was in lockdown, she was getting chaotic messages everyday about what was happening. Can’t imagine how it must’ve been in Beijing then. Asking my employees now (all in the early twenties up) most don’t even KNOW about it and those who do don’t really care. I think that’s the real tragedy of the whole thing – the not caring. I have really enjoyed watching the SCMP’s running list of Sina Weibo posts (within China) that have sought to evade censors: http://www.scmp.com/comment/blogs/article/1253135/chinese-evade-online-censors-remember-tiananmen There are some brave folks that do care and do remember. Thank you for the reminder. Now 24 years later people all over the world are “speaking truth to power.” The images from Istanbul this week are haunting in this regard. Wonderful post! I’m glad you liked it. You are so right the the events in Istanbul have some strong parallels in terms of a government’s harsh over-use of force against it’s own people. How sadly often the people must “speak truth to power.” We watch it happening all over our planet now. Great post reminding all of the powerful voices of people who are dedicated to changing the world . .
It’s utterly disheartening to think how much the students and other protestors lost when they made their critical voices heard. It reminds us all how important it is to commemorate this event (in Hong Kong and elsewhere) since it is all but erased in mainland China. Wow! Thanks for the reminder. Victoria Park is a beautiful sight; dark and silent in the middle of the city, save for the candels. The most gut-wrenching thing is when the parents who lost children on that day speak about their pursuit of justice all these years and still no apology, let alone acknowledgement. The thought of what the students (and other protestors and their families) gave up is completely chilling. Especially when one looks at key mainland China news sites today and sees no reference or acknowledgement at all. I wish I could make it to Victoria Park tonight. Sounds like you have been there before. Wow. I’ll have to look that book up. 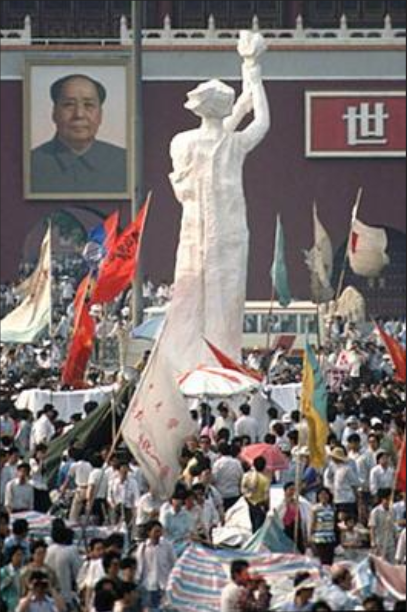 I ashamedly didn’t know anything about the Tiananmen Massacre until I moved to Taiwan… It happened when I was really little and had no concept of what China or communism even was… I wish I could have gone to one of the vigils while in Hong Kong. This is something no one should ever forget. I can’t believe the government won’t allow people to wear mourning clothes.. Jerks. Oh, wow. I’ll take a look. Thanks so much! I really love these clever attempts to skirt the censors! They underscore how ridiculous it all is, since there is always another way to represent June 4th. I particularly love calling it May 35th! So glad to find someone who has read Beijing Coma. I really loved that book and learned a lot from it about the on the ground organization. Those Atlantic photos are incredible. I picked up Beijing Coma after you recommended it to me (at that WIPS event)! I really enjoyed it, even if it took me weeks to finish.